YAY!!! I'm going Trick or Treating! 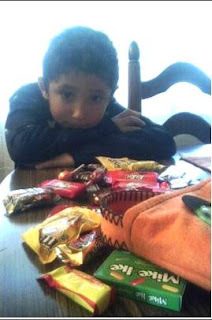 I got lots of CANDY! My PC is running too slow lately. I haven't been able to comment your sites without clicking twice. And sometimes my comments go through twice. I'm sorry for this and still trying to fix this problem. Hope everybody is having a great week. 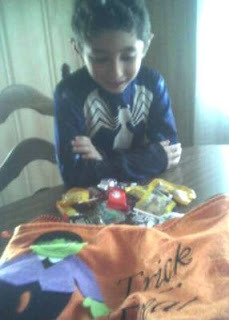 My son decided to be a spider-man for this Halloween. 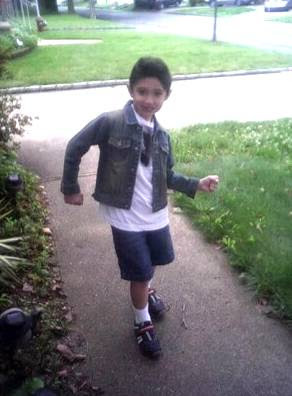 We looked for a Michael Jackson costume. Only could find them at Target but, they were all WAY too big. 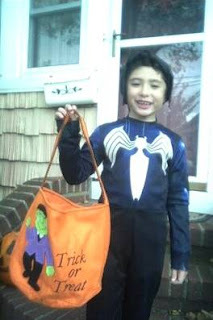 Then he changed his mind and decided to be a SPIDERMAN!!! My hubby loves this traditinal Turkish dessert. He kept asking me last week. 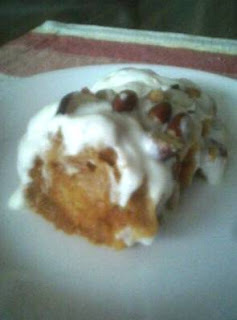 This is traditinal, popular Turkish dessert and very easy to make. 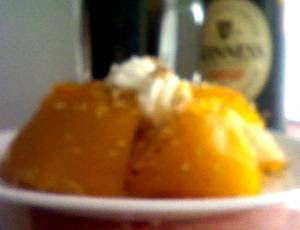 Cut the pumpkin into big chunks, place in a wide saucepan, layered with the sugar. Sprinkle with the water and leave to stand for a few hours until pumpkin is juicy. 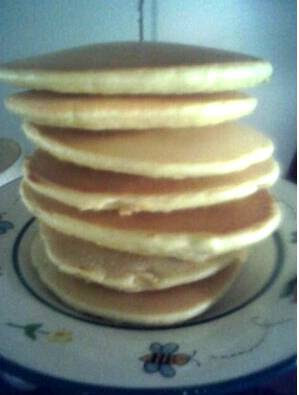 Place the pan over a low heat, add cloves and lemon juice.The cloves give a nice spicy warmth to the syrup. Cover it and cook until tender. Arrange the pumpkin pieces on the serving dish. Let it cool. Sprinkle with crushed walnuts or grated coconut. I also spread some whipped cream on top. Ready to serve! Yep, my hubby will love me even more for this one. Hehe.. Break cookies in pieces. In a bowl combine pumpkin, sugar and spices. Add cookie pieces and mix it. Place the mixture in Pyrex pan. 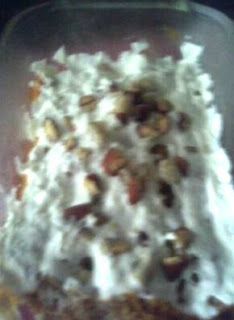 Cover with whipped cream, and top with crushed nuts. 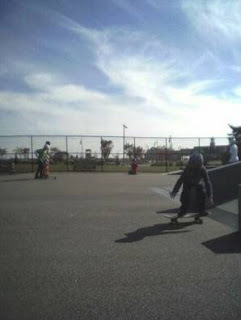 Ever since he got his first skateboard last summer, it's all he talks about. .
We went to the skatepark yesterday. 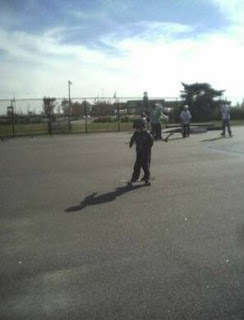 It was fun to watch him trying.. I have been blogging all week! I know I look tried. But I love mornings...My son wakes up like 7.30am. My hubby goes to work like 5.30 am. I was up earlier than usual this morning. I used to go gym and used to join Pilates&Yoga classes until this year. 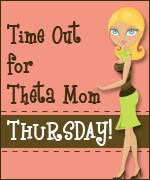 And now, I 'm heading Theta Mom to see how the other moms spent their time out. Click her cute button and join me!!! Chocolate scented candles create a wonderful ambiance in a home, and they make lovely gifts. 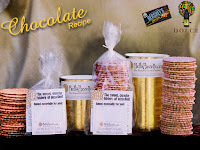 Bellapizzelle chocolate & orange scent candles are NEW! Besides, you can find orange & anise and orange & vanilla scented candles on this website. Those deliciously scented pizzelle candles have been custom blended to smell. Great for kitchen! To see the prices or to order click here. 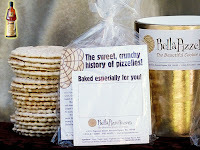 Also, delicious two short stacks of BellaPizzellesa would be such a great gift for your friends. One stack of 20 original pizzelles with real orange and vanilla extracts, and other stack of 20 pizzelles with real orange and anise extracts. Your friends will enjoy the Old-World taste of real Italian pizzelles, crunchy Italian cookies that make great gourmet gifts. FREE hand-written gift card and FREE pizzelle history in every tube! Once they receive your order, they bake within 48 hours and ship. Anise or chocolate candles, a short stack of fresh vanilla, anise or chocolate pizzelles, one dozen of Lucy's homemade biscotti, one brick of LavAzza coffee, and a personal note card.. Authentic Italian specialty cookies handmade to order! A heavy splash of Dolce Chocolate Syrup and plenty of Hershey's Mini Chips... plus real orange extract.... It sounds like a new wonderful taste! Doesn't it? Congratulations! Grissell, please send me an email. Thank you to everyone who entered my first giveaway. I really appreciate your support. 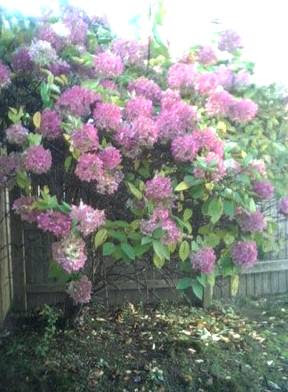 Couple of pictures from our back yard.. He loves dancing..Even if he just gets excited about something he will start to move. 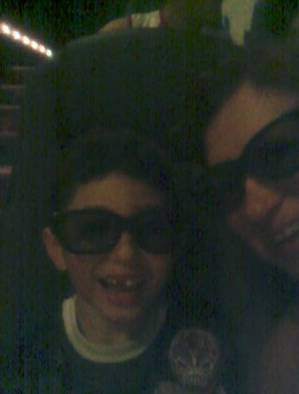 Aren't we looking so funny with those 3D glasses? An organized kitchen is a happy kitchen! Looking for more space in your kitchen for pots and pans? Would you like to keep them more organized and easier to get to than in a standard cabinet? Hope, this post can help you. In standard cabinet, if you need a middle or bottom pan, you have to lift the ones above it, so you can't stack them high, they are pain! Enclume pot rock products are especially suited for today’s midsize or large kitchens. Hanging pot rocks, lighted pot rocks, wall mount pot rocks, freestanding pot rocks, pot rock accessories, baker's sideboard base and more.. If you really don't like to hang your pans and pots, here is a freestanding cookware stand. Enclume wall mount pot rack is another shelving option or storage unit that attach to your wall. Enclume Freestanding Cookbook Holder. You can find different types of cookbook holder on Enclume Pot Rock site. Another thing I really liked is Enclume 20 Bottle Wine Rack. Your choice of wine rack comes with all its hardware, a hex wrench, and full assembly and maintenance instructions. You can create a warm and fun gathering place in your house for your family and friends. Click Enclume pot rock to see the prices. If you need more space for baking stuff, this sideboard would be useful. Enclume Baker's Sideboard Base will organize your pots and pans..Easy to reach location and very stylish! There are two hammered steel grid shelves of this product. A kitchen is the hearth of the home. Adding storage space will help you to be more organized..
Last Sunday was a beautiful day. 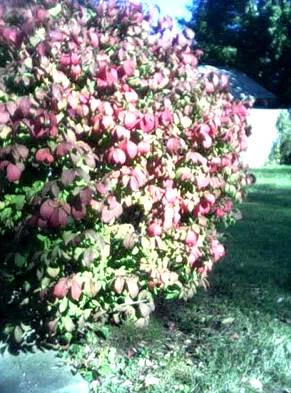 Colorful leaves, orange, brown and black decorations everywhere... Sun was warming on my back..it was gorgeous outside. My son and I hopped on our bikes and started pedaling all the way around the house. Oh Gosh, he doesn't need a break! But I do..hehe :) We sat on the grass in a small park around the house and rested for a few minutes. Grabbed our water bottles. Oh yeah, this is life! If I am thirsty, nothing works better than water. Then we started pedaling again our way through home. My lovely neighbor was decorating her house. After a little talk with her, we got back home. Aria was watching TV. A quick shower made me feel better. Even a lot of thoughts running through my mind. It was a good start! Now, I'll stop Theta Mom and see how other moms spent their 'time out'! Last a few weeks I'm honored to receive all these beautiful blog awards. You made me so happy :) Thank you ladies!!! Hottest Female Blogger Award from Ems at Beauty Inside & Out She is a great blogger and wonderful bloggie friend. Thank you Ems!!! 2. Post it on your blog together with the name of the person who has granted the award and her blog link. 3. 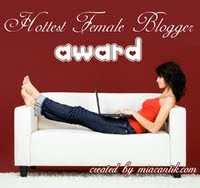 Choose 10 female blogger that you know and have never received this Award. Vicki says 'This lovely award is all about warm fuzzy feelings you get when spending time with close friends and family'. Love it!!! 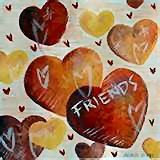 Yes, It is from Vicki at Frugal Mom Know Best Thank you so much. I really appreciate it! 2. Nominate up to 9 blogs which make you feel comfy or warm inside. 3. Be sure to link your nominees within your post. 4. Let them know that they have been nominated by commenting on their blog. 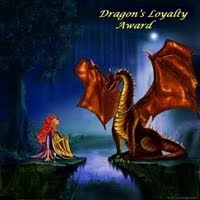 Another Award from Vicki is Dragon Loyalty. Kreative Blogger Award is from two great bloggie friends. Margaret at Facts from a Fact Woman . 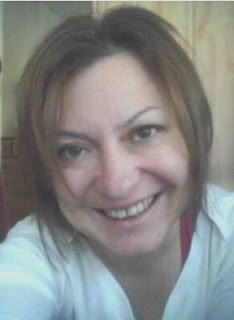 I love to stop her site..Hints, rants, yum recipies, great household tips and more! Thank you Margaret. It means a lot to me!!! Leslie at A Blonde Ambition -Health, beauty, fashion. television, music, techonology and more..a great blog to see!!! Thank you Leslie!!! -One of my favorite snack items is yogurt. -I love a good glass of white white with fish. One lovely blog which I enjoy to read everytime. Thank you so much Crystal. -Thank the blogger who gave it to you. -Pass it on to 6 of your favorite bloggers-and answer the following questions with only one word. I'm truly appreciate to receive 'One Lovely Blog Award for 4 th times. This wonderful award is from 3 beautiful bloggie friends. Ianne at Pink Notes Diary. It really did bring a smile on my face :) Thank you Ianne!!! You're such a great friend. And Heather D at Penny-Pinching Mama- You'll find great giveaways on her site. You don't want to miss them. Thank you all!!! I feel very honored that I received the 'Friends Award' for the fourth times :) This beautiful award from Jackie at 3 Little Ones. I always love to stop by her site. Thank you Jackie!!! 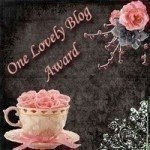 The Best Blog Award from Tami at Hearths Make Families Love her title :) and her beautiful blog. And I'm very honored to receive this beautiful award from Momma Such at Raising My 4 Sons . Thank you Momma Such! I really appreciate it! If you haven't stopped her site yet, now it is time!!! You will love her blog! 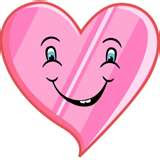 1-Post it on your blog together with the name of the person who has granteed the award and his/her blog link. 2-Pass the award to 15 other blogs that you have recently discovered and think are great! Thank you all! You know me..I love to share my awards all of you guys. I made an quick veggie dish! Cooking cauliflower this way is quick and delicious. To prepare the cauliflower cut into tiny trees. Rinse under water. Heat the olive oil in a large skillet. 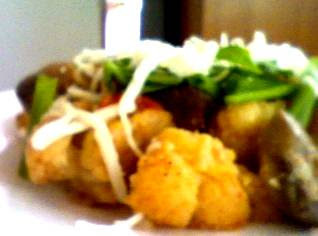 Add the cauliflower, vinegar and countinue to saute until piece are soft. In a medium skillet saute 2 tbsp olive oil and the mushrooms. Add mushrooms, tomato cubes, garlic, salt and spicy. Cook until tomatoes are soft. Remove from the heat and toss them sliced green onion/parsley (or both), Mmmm.. yum! I sprinkled with shredded mozzarella cheese. Ready!!! Serve with pasta! BTW, have you enter my first giveaway yet? Oh come on! Click here to ENTER! Does your child like doing math or understand it well? I was talking to one of my friends yesterday. She has a son who is 10 years old and he doesn't like doing math. She is a working mom and really doesn't have time to help his son doing his homework. My friend has been very upset about it. I tried to help him a couple of times but he needs more help then I do. I learned about this website and sounds cool to me. I told her she can get help on the internet. Have you ever heard TutorVista's online math help? Actually, I haven't either.. until yesterday. This online math tutoring program helps to understanding algebra, calculus, precalculus, geometry, trigonometry, statistics, probability, linear programming, discrete mathematics across K-12. They provide whether students need math help or some quick assistance in solving math problems before a test or an exam, with instant help, homework help and with assignments in math. The best part is the tutor and student talk to each other using voice(VoIP) and share an interactive whiteboard to work problems. Isn't it great? I haven't had any experience with this site but I think it might help kids understand math better. Also they have free demo service. Free online math help. Type your question and get free online math help on math problem solver. Sounds good though! Here are the links: Free online math help, free algebra help, free collage algebra help, help with math. It is not easy working long hours, coming home, preparing dinner...then resting? Nope, solve math problems all night! They also offer unlimited monthly tutoring package for only $99.99 a month for all subjects - students can use this service as much as they want and whenever they need it. It is available 24X7. Another good thing is no wasting time in travel. It is good to know there is a website like that. If your kid is having difficulty understanding math, math help can change your daily routine and also put a smile on your and on your child's face. I am sooooooo excited to be able to do my very first giveaway! DON'T FORGET TO ENTER !! Every Saturday Aria and me spend some time together. 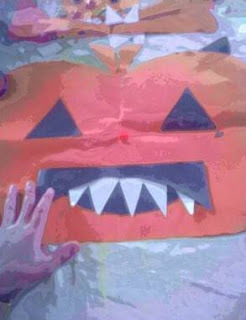 Today, we had so much fun with this pumpkin. The idea came from Vicki! Stop Frugal Mom Knows Best and enjoy the fun activities and giveaways during this month! I put a smile on its face but Aria wanted a scary look:) So, here it is!!! What do you need to consider before deciding to purchase any of them??? If you need a new cookware, be sure stop by ShopWiki and take a look what you need to consider before buying some new cookwares. Cast iron, stainless steel, copper and aluminum...many types of pots and pans and great tips you might want to know before choosing. If you need a new refrigerator, read those tips before buying. Bottom Freezer, French Doors, Side by Side..click to see here. If your kitchen close to the living room you will want to find a fairly quiet model. Mmmm.. Maytag Side-by-Side Refrigerator looks good though! Dou you need a new washing machine? Or a new dryer and if you will place it in the basement or another dim area, find a dryer with an internal light then you can find those socks that get stuck in the back! more tips.. If it is time for a new mower? Here are a few main styles... If you are looking for something inexpensive lightweight or push mower or if you need more powerful engine, but also a bigger unit, check those out! Accessories, Babies & Toddlers, Food & Beverages, Computers & Software, Books, Movies, Music, Home & Garden, Jewelry & Watches, Arts and Crafts, Health & Beauty and more..
OK, I saw a Stainless Steel Fish Poacher and really like it. I don't have any. It looks like a good product. Doesn't it? Shiny stainless steel, looks like easy to clean and also the lenght is great for fitting on two burners over the stove. You will find a lot of cool things on this site. Now I'll go and check out that Stainless Steel Fish Poacher :) Hehe..
Don't forget to enter MY FIRST GIVEAWAY! Chocolate Covered Cocoa Almonds! A new report says that one way to make yourself happy is to look through old photo albums. I was alone this morning. 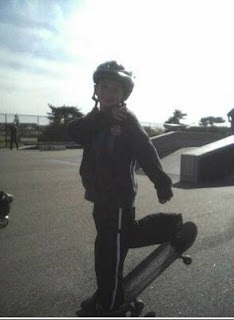 Some old pictures and memories... Sometimes I cried, sometimes laughed loud. Time is going by way too fast!!! Unbelievable!!! 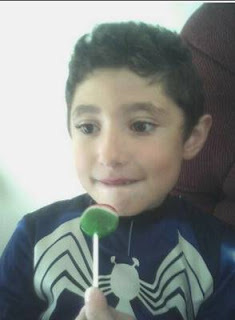 I want to share those picks of my son with you guys. ..not too old just a few years ago. (Halloween/2004) 5 years??? I can't believe it! I hope everyone had a great time out this week! I can't even wait to read how other moms spent their 'me time'. If you like to join us stop by Theta Mom. Enter my first giveaway! Chocolate Covered Cocoa Almonds! YUM..WIN SOME!! !